Say Aloha to one of Maui’s most unique and beautiful places to dive and snorkel. Molokini, a crescent-shaped volcanic crater about 3 miles off Maui’s south shore, is a world renowned snorkel spot with excellent visibility and depths ranging from only a foot near the shore and 20-50 feet in most dive spots, to over 300 feet at its deepest points. It has an area of 23 acres and is almost a half mile wide, with it’s unique shape creating a protective oasis from waves and strong channel currents. It is the remains of one of seven volcanoes that formed the prehistoric Maui Nui island over 230,000 years ago. 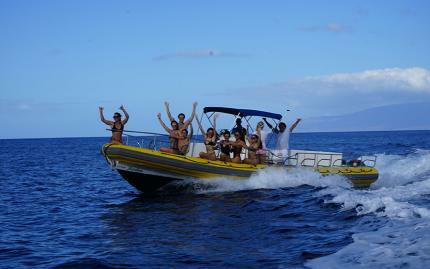 This tour will take you to Molokini Crater on an exhilarating 30 minute ride and arrive with ample time to avoid crowds. Discover over 250 different species of reef fish and hundreds of species of coral! Weather permitting, you will participate in a “float snorkel” on the back side. This is a special treat very few companies offer! After, take a short ride over to “Turtle Town” where you can swim among the colorful fish and abundant population of Hawaiian Green Sea Turtles that make this cove their home. A Molokini Snorkel Trip to the crater’s crystal clear tropical waters is a must-do activity for any visitor to the island of Maui.